The Central New York Regional Market in Syracuse, New York was brimming with activity last weekend with people looking over the local farmers and vendors fresh and locally grown Spring treats. From top left, fresh picked strawberries, salt potatoes, raspberries and blackberries and early sweet corn. Strawberries were king as I saw people buying them in flats of four and eight quarts to take home and make into strawberry shortcake, sundaes, pies, muffins or dip them in melted chocolates. Raspberries and blackberries are tasty natural sweets or to use as toppings on ice cream or waffles. Before one can get to the dessert, you have a meal. Salt potatoes and sweet corn are Central New York staples at summer cookouts, clambakes and barbecues. 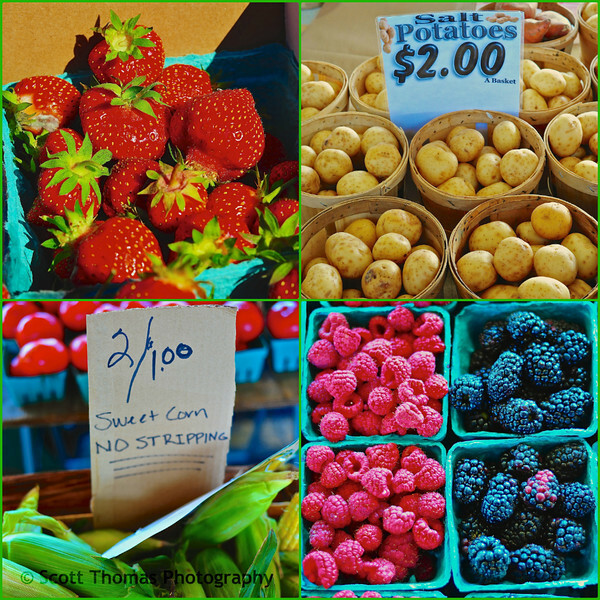 This entry was posted in Travel and tagged blackberries, central, cny, food, new york, no stripping, raspberries, regional market, salt potatoes, strawberries, sweet corn, syracuse. Bookmark the permalink. Mm, looks delicious. So great to see corn and raspberries already – seems early, especially if they were grown in NY state. Corn, fresh berries and of course, a home-grown garden tomato are favorite summer treats of mine. Yummy! What a colorful array of delicious food. 🙂 I don’t think I can pick a favorite. I like all the tastes of summer.